International Journal of Research in Health Sciences,2014,2,4,1121-1124. 1-Associate Professor. 2-Senior Resident. 3-Junior Resident. 4-Prof & HOD, ESI-PGIMSR and Model Hospital Andheri-93, Maharashtra, INDIA. We report a rare case of primary squamous cell carcinoma of cecum. A 74 year old lady was operated for tumor of cecum involving adjacent ascending colon. We received right hemicolectomy specimen showing large, necrotic and friable mass arising from mucosal aspects of cecum. 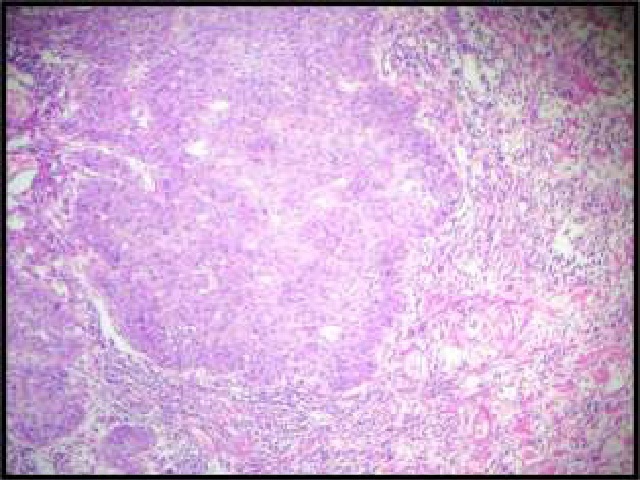 Microscopically tumor consisted of nests of atypical squamous epithelial cells, which was confirmed on immunohistochemistry. Keeping in mind the diagnosis of primary squamous cell carcinoma, additional examination was recommended to rule out possibility of metastasis from other sites. Extensive clinical examination including PET/CT scan showed no additional tumor. After exclusion of possible metastastic disease, the diagnosis of primary squamous cell carcinoma of cecum was confirmed. Primary squamous cell carcinoma of cecum is exceedingly rare malignancy. Before such a condition is accepted genuine care must be taken to exclude metastatic tumor presenting as primary growth, most likely from cervix in females.